Investigate a series of burglaries for a Bal Oyra shopkeeper. 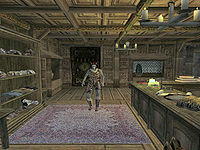 Galan Brandt tells you that your next quest involved investigating some burglaries that have been taking place in Jana Livia's store in Bal Oyra. The quickest way to Bal Oyra is to use the Guild Guide in the basement of the Mages Guild, who will transport you to the Keep in town for a small fee. Jana's store is to the north west on the left-hand side of the street. Jana tells you that you will have to wait in her store overnight to catch the burglar but that you will have to wait somewhere out of sight so he isn't scared off. She suggests waiting in the stairwell at the back of her store. When you move into the right position on the stairwell you will receive a message telling you that it's a good place to wait. Next, use the Wait function and wait for several hours. Your rest should be disturbed at midnight by the entrance of Olroth Madri, who will attack you on sight. Once Madri is dead, head back to Galan Brandt for your reward. If you killed Madri, Brandt will give you 100 gold, and you receive one reputation point and three Fighters Guild reputation. If you waited in the wrong place and "scared off" the burglar, you receive only 50 gold and one guild reputation point. If you let the burglary occur, you are demoted in rank and Brandt's disposition towards you drops 20 points. Once you have talked to Jana Livia, you must be waiting in her store at midnight or the burglary will occur and you will be demoted. If you wait anywhere other than in the stairwell, Olroth Madri will not enter the store. Although no burglary takes place on that particular night, it occurs later and you will be demoted during the Bounty on Jalian quest. 10 Galan Brandt wants me to go to Jana Livia in Bal Oyra and help guard her shop. There have been a series of burglaries there recently, and Jana has requested Fighters Guild assistance. 20 Jana Livia tells me that all the burglaries at her shop appear to have been perpetrated by the same person. She wants me to stay overnight at her shop, and see if I can catch anyone in the act. Hopefully that will stop the burglaries for good. 25 I heard signs of a break in at Jana's shop. I should investigate. 30 In the night, I was forced to kill a man who attacked me when I caught him sneaking around in Jana's shop. He must have been the burglar. 31 I took a nap while guarding Jana's shop. If a burglar turned up, I certainly didn't notice him. 32 I left Jana's shop and didn't stay the whole night. If there was a burglary, I will likely have missed it. 33 I did not hide where Jana suggested, and I believe I just scared off the burglar. I should probably consult Jana as to what to do. 100 Finishes quest Galan Brandt thanked me for stopping the burglary at Jana's shop. 101 Finishes quest Galan Brandt said that he was pleased Jana had released me after just one night's vigil. He wasn't impressed that I hadn't been able to catch the burglar, however. 105 Finishes quest Galan Brandt told me that Jana had reported another burglary at her shop, and was furious that I hadn't stopped it. He demoted me for besmirching the Guild's honour. 106 Finishes quest It turns out that I had indeed only scared the burglar at Jana Livia's shop temporarily. Jana had reported a fresh break-in, and Galan was furious. He demoted me for besmirching the Guild's honour by failing to stop the burglary as instructed. 10 Jana thanked me for dealing with the criminal. I should report to Galan Brandt. 20 Jana was disappointed that I had not been able to end the burglaries for good, but thanked me for my efforts. I should report back to Galan Brandt. This page was last modified on 17 March 2019, at 02:15.